Baglietto spa and Mr Maurizio Cozzani, in his role of Sales Consultant for the company, announce the consensual termination of their contractual relationship. Baglietto SpA wishes to thank MrCozzani for his competence and commitment and wish him all the best for his personal and professional successes.Baglietto informs that a reorganization process is undergoing and Sales Direction will be soon appointed in order to push the brand positioning on international markets. Ferretti Group presented its higher than expected results as of the 31st of December, 2015 today in Milan. Moreover, the Group also announced the entry of F Investments S.A., a holding controlled by the Ferrari family, into the share capital of Ferretti International Holding S.p.A. by the acquisition of 13.2% of the share capital. During the press conference Alberto Galassi, CEO of Ferretti Group presented the results of the financial year 2015. Nonetheless the persisting difficult market conditions, the consolidated production value has been 410 million euros (+23% compared to 334 million euros of 2014 and also higher than the Forecast at the beginning of 2015 that was established at 403 million euros). The EBITDA turned positive for the first time in the past four years and equals 7 million euros. This result is significantly better than the expectations as the forecast EBITDA was -1 million euro. This achievement means that the loss has been halved compared to that of 2014. The EBIT and loss are respectively -13 and -29 million euros. The CEO has also announced that the first quarter of 2016 will report profits of around 5 million euros. The FY 2015 performance led to a positive review of the 2016 outlook, thus production value by the end of 2016 is expected to transcend 550 million euros, while the EBITDA is foreseen to reach 50 million euros and the Group to be profitable. It was possible to exceed the objectives set by the development plan for 2015 thanks to the implementation of the relaunch, development and growth strategies presented a year ago by the Group, following the capital increase of 80 million euros of the main shareholder, Weichai Group. From this amount, 50 million euros were allocated to the design and launch of 27 new models and to the expansion of sales activity towards both mature and emerging markets. Mr. Galassi confirmed the success of the 6 Ferretti Yachts, Riva, Pershing and Custom Line models presented in 2015 that have been the absolute growth drivers of the year. Furthermore, he announced the arrival of 9 new yachts of the length between 12 and 37 meters that will be ready to debut this year. Ferretti Group is continuing its active presence in Mainland China market in the new calendar year, now back to Sanya again for the famous SiNan Regatta in its fourth edition since 2013. SiNan Regatta is the only professional sailing race event in China that has the nautical route to Xisha Islands and the furthest off-shore regatta event. With its standard, profession, influence, appeal, popularity and reputation being increasingly improved, SiNan Regatta is reputed to be a pretty sailing business card of both cities of Sanya and Sansha. SiNan Regatta is also the only regatta in China attended by boat owners themselves, gathering hundreds of sail boats and motor yachts owners and social elites who are fond of yachting from all over the country. In the racing course, a series of experience activities, banquets and parties related to the popularization of sailing culture and lifestyle are held in addition to the professional track race and long-distance rally, with a view to forging the most high-end social community for sailing elites. Being the exclusive motor yacht partner, Ferretti Group will bring two of its best-selling yachts: Ferretti Yachts 650 and Ferretti Yachts 690 Hard Top, to accommodate invited VIP guests on board to enjoy the magnificent sailing fleets from no distance, and experience Ferretti Yachts’ comforts, power and performance along the attractive Yalong Bay coast. SiNan Regatta is not only sailing racing, but a multi-platform entertainment lifestyle week for the boat owners and their friends. Apart from daily off-shore sail racing, guests can enjoy sail training, art show, cocktail, gala, Texas Hold’em Challenge and golf tournament every day from morning till mid-night. Ferretti Group sponsors the week’s Ferretti-SiNan Cup VIP Golf Tournament at Yalong Bay Golf Club and Hotel. Estimated 200 guests will join this 8-day tournament for the final top rankings. The champion will win an exclusive Riva motor yacht scale model. The owner of the 147-foot expedition yacht Dorothea III built the Hatteras 45 Express Post One so he and his guests could fish all the hot spots that the superyacht visits on her epic voyages..Designed for targeting game-fish offshore, the quick and nimble Post One has accompanied the superyacht as a tow-behind tender since last year. “We took delivery of Post One in the latter part of the summer,” said Dorothea III’s captain, John Crupi. “Since then, we have towed it nearly 5,000 miles and we’ve put a little over 600 hours on it. We’ve gone to the Bahamas, to Colombia, through the Panama Canal, and to Costa Rica. We’ve been fishing about a week a month in the best places you can imagine.” He gave an example: “On March 18th, we were fishing Isla Jicaron on Panama’s Pacific Coast. At around 4 pm we raised and hooked a 550-pound blue marlin on 30-pound main line. The fish was fought till the early evening hours and released at 7 pm.” On its last fishing trip off the northern coast of Panama, Post One released 33 sails over three days and brought home a nice tuna for fresh sashimi onboard Dorothea III. Held during the Singapore Yacht Show, the twelfth edition of the Asia Pacific Boating Awards was a great success for the Sunreef Yachts shipyard. At the evening gala, the remarkable Sunreef 70 Power Blue Berry launched in 2015 was awarded as the Best Motor Multihull in the World. Boasting generous, custom-designed living spaces along with a lofty open saloon, this 70 Power can host up to ten guests in the luxury of her interiors including a front-placed master suite with a panoramic view. With her aft hydraulic platform, spacious flybridge and a large cockpit opening onto the saloon, she proudly represents the Sunreef 70 Power as a model known to combine the best of comfort, performance and offering oceanic range. After 10 months of filming, Sunseeker International is pleased to announce that the exclusive BBC Two documentary ‘Britain’s Biggest Superyachts: Chasing Perfection’ will be airing this Friday 15th April at 9pm. The programme sees the BBC film crew follow the build of Sunseeker International’s new 131 Yacht through to its launch. For the first time ever, the film crew filmed fascinating behind the scenes footage to capture the journey of the new 131 superyachts from concept to build at the manufacturing facility in Poole, and then through to final delivery. The 131 Yacht enables its owner to tailor every element of the interior design and layout to their personal preferences via Sunseeker’s unique ‘Bespoke’ service, which is highlighted in the documentary. As well as documenting the build in its Dorset shipyards, filming also took place during the boat shows in the latter half of 2015 and at the London Boat Show this year, with several people from Sunseeker’s world-class team appearing in the one hour program. Fifty-two years ago today, brothers Bill and Bob Healey opened the doors to a small building with dirt floors that would eventually evolve into the world's leading manufacturer of semi-custom convertible sport-fishing yachts. Starting with wood, Viking built a fleet of 37-foot cruisers, which gained a reputation along the waterfront and served notice that this local South Jersey builder was in it for the long haul. The Healey brothers built the company with a captivating phrase to "Build a better boat every day" and the fleet soon expanded to include motor yachts to broaden its horizons in the growing marine marketplace. By the early 1970s Viking had made a sea change to fiberglass and in 1972 launched the 40 Sedan Fisherman with a unique engine mounting system featuring structural steel web frame I beams, well-suited for diesel installations. The Viking 40/41 would remain in production in various configurations for 16 years and over 600 were built during this amazing run. The 1980s was a significant decade for Viking with ten boats added to the product line from 35 to 50 feet in convertible and motor yacht models. Viking was on a roll and every competitor knew it. The 1990s started slowly. A federal luxury tax in effect from 1991 to 1993 caused the marine industry to run hard aground as buyers abandoned the market. Viking buckled down, took on Washington with protests and demonstrations with Bob Healey in the lead, while Bill Healey and a skeleton crew kept the doors open and worked on new designs. By the time the tax was repealed the buyers returned and Viking was ready with new models. Business picked up but the game changer was the 1997 Fort Lauderdale Boat Show and the introduction of the 55 Convertible. This boat was the turning point for Viking with a host of custom boat features including increased bow flare, an unbroken sheer-line, frame-less salon windows, flush-mounted engine-room vents, a helm pod with single lever controls and a massive cockpit. It marked a new future for all Vikings that would follow as they would share many of these attributes. The roaring 2000s saw larger models like the 70 Convertible demonstrate that large convertibles were perfect tournament contenders and would lead their anglers to the Winner's Circle. 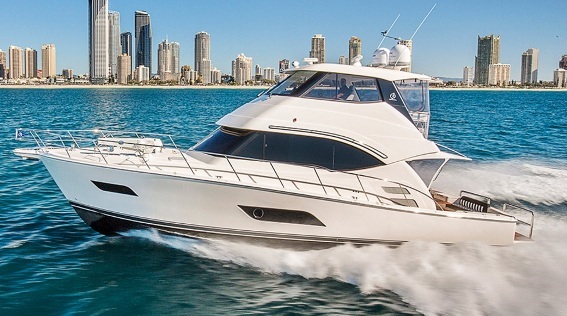 At the 2014 Fort Lauderdale Boat Show, a new flagship, the 92 Convertible premiered. In the same year Viking also returned to the motor yacht market with the launch of the 75 MY. In 2015, the Viking 80 launched to critical acclaim. As Viking enters into its 52nd year it continues to move forward and maintain the position as the world's leader in luxurious convertible sport-fishing yachts. Cantiere delle Marche presents the project of the currently in build 102 Darwin, confirming its on-going success in this line of yachts. In the five years since being launched, the Darwin Class and the Nauta Air lines have pushed the shipbuilder into a dominant position, representing approximately 60% of the 80 to 110 feet steel and aluminum Explorer Yacht market. The 102 Darwin Class, is due for delivery in 2017 to a European owner, with contract signed in the aftermath of the Cannes Boat Show. 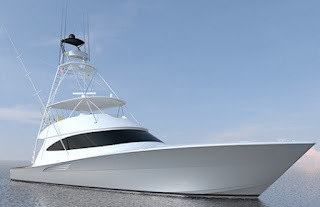 While maintaining all of the features of the pure Darwin Class style, this 102 boasts a series of interesting customization, both with regards to function and design. One of the first requests of the made by the buyers was to include a fully-equipped fitness area so to keep up with their daily workout routines, even when they are at sea and far away from their regular gym. In order for them to live an active life while enjoying the oceans and their sailing destinations, careful attention was devoted to the lay out of the garage; it will be equipped for and designed to hold numerous toys and transportation vehicles, as well as a complete diving center. The already ample spaces were specifically designed and re-proportioned in height, exceeding the already excellent standards that are the norm on all Explorer yachts in the Darwin Class. The interior height allowances were increased to 2.18 meters, something incredible for a 100-foot yacht and consequently, all of the doors and windows were re-proportioned. This way, the owner will not have to suffer any of the classic problems that particularly tall people experience on a yacht of this length. All the technical standards that have made CdM a benchmark in its sector have been maintained: 12mm steel hull, cupronickel piping, independent rudders, automatic generator parallel, electric fins stabilizers, as well as waste-water treatment systems for black, gray, and bilge waters that have been adapted from the world of work ships and designed to be used 24/7 year round. The interior spaces will be designed by Italian interior firm PFA and Partners, which is partnering with Cdm’s project managers and the owner, to design the interior layout. The interior will offer four cabins; Master, VIP, and two guest cabins, plus three crew cabins and a captain’s cabin adjacent to the bridge. The owners have proposed a warm and welcoming interior style, where the walnut wood tones find their perfect complement in the wallpapers, the leathers, and the other luxury materials used to create a very cozy atmosphere. The theme that pulls it all together will be the pairing of classical style and modern touches, especially in accessories and free standing pieces of furniture that offer a tremendous visual impact in terms of form. 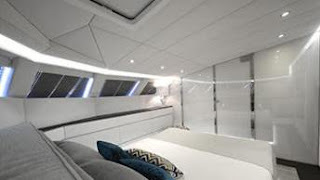 The owners personal cabin was the object of particular focus; a large full-beam space in the center of the yacht, with a highly original solution for connecting the sleeping area with the bath and dressing room area. Launched in May 2015 at the Sunreef Yachts shipyard in Gdansk Poland, Blue Belly is now opening her interiors to the public. Being the twelve unit from the timeless 70 Sunreef Power line introduced and designed by famous sailor Laurent Bourgnon in 2008, Blue Belly is the first build 70 ft power catamaran from Sunreef with a fully open saloon. The idea of having a 70 Power by the owners came in 2014, straight after the launch of their first yacht, a Sunreef 60 Power. The stunning 60 footer unleashed desires of owning a yacht of a bigger size and with an appreciation for luxury design and for spending indulgent time aboard, the 70 feet catamaran seemed to be the best option for such discerning clients. Knowing the client`s needs, Sunreef Yachts in coperation with designers Orna Weitz and Brosh Alon opened the living area on the main deck and eliminated the interior navigation station in the saloon. In this way, an incredible amount of living space combined with the lounging and dining area was achieved. As 70 Power number 12 is dedicated to short cruises, the yacht is equipped in the exterior helm station on the flybridge. Straight from the saloon is direct access to the master suite located at the front of the yacht. Following her predecessor 1 Life launched in 2014, Blue Belly`s master cabin features panoramic views and has a spectacular magic glass panel separating the his and hers bathroom from the sleeping area. With good sales currently incoming from the 57 Predator, Sunseeker thought wisely to return its attention on the smaller sizes of its range. Here comes the project for a new 52 Manhattan as entry level to its flybridge range, which will be available with IPS pod or shaft drive option and a max of 725hp per engine. The new 52 Manhattan will offer interesting accommodation solutions and feature one of the largest side window profile for a Sunseeker flybridge. 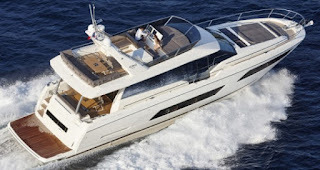 It's flybridge will also be a spacious affair while unlike the 55 we see the use of the astern galley. The accommodation layout will feature a three double cabin interior, plus an aft crew cabin. Option will also exist for a standard bathing platform, or an extended up down tender lift system which increases length by four feet. After the acclaim received for the 500 Fly, Galeon ups its game and on the same platform presents the new 510 Skydeck. The 510 Skydeck is all identical in the technical details, yes you get the expanding aft deck which from a beam of 4.4 meters becomes six with an impressive advantage to the entertainment space available at anchor. But the difference in the 510 Skydeck is the fly deck which is more or less non existent, and here offers a sunpad and a sunroof catering to one-third of the main deck, and more sportier profile outside. Down below and engine specification are all the same, with the 510 Skydeck offering a three double cabin layout with full beam owners room, VIP to fore, and twin bunk to starboard, plus a crew cabin aft. 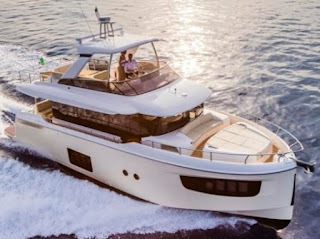 In the year of the twentieth anniversary of Ferretti Custom Line, the company launches the new Navetta 37 and plans the future of Custom Line semi-displacement series. At “Yachts Miami Beach 2016” the Group has announced the birth of the biggest Custom Line Navetta ever built, the astonishing Navetta 42. The Navetta 42 is the first Custom Line ship over 300 Gross Tonnage and it will be launched in 2018. 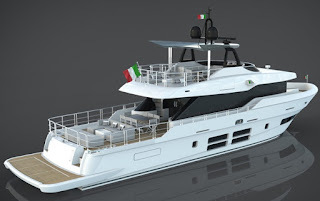 The new ship is designed by Studio Zuccon under the guidance of the Ferretti Group’s Strategic Committee and developed by the in-house Engineering Department. The 42 Navetta will feature some interesting details as its four decks offering even more spaces for the owner and his guests. As all the Custom Line’s super yachts, the 42 interiors and exteriors are fully customization. Owner will enjoy his huge suite on the main deck, while the versatile lower deck is able to be designed with 4 VIP or 5 suites. Captain will have a private cabin on the upper deck with direct access to the pilot house, while the crew area may be fitted with accommodation up to seven berths. As in the 37-meter, the new Navetta 42 will ensure the most efficient organization of on board flows, offering total privacy for the Owner and the guests, and great freedom of movement for the captain and the crew. The stern area consists of a huge beach club at the sea level, devoted to leisure time, thanks to the side opening garage with water toys launching system. Ferretti Custom Line Navetta 42 will be available with five different engine options, powering from 1400 to 1825hp. The super yacht will be able to reach a transatlantic range of more than 3000 nautical miles at the economic cruising speed of ten knots. 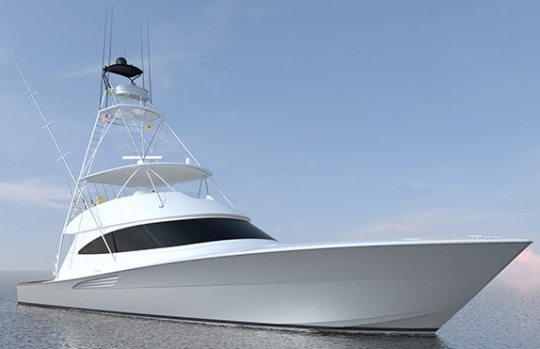 Viking’s peerless sportfishing yachts continues to wave its reign as the New Jersey boat builder introduces the project for a new 72 Convertible set to launch in the mid second half of 2016. The first version of the 72 to launch will be the standard Open Bridge, which will feature accommodations layouts with four staterooms, all featuring a private head. The main deck will feature a J-shape sofa in the salon, a U-shape galley with custom granite counter-tops, crown molding on upper cabinetry, and a large walk-in pantry forward. An option exists for the forward stateroom to feature a queen berth in the forward stateroom, or crossover berths in the forward cabin. 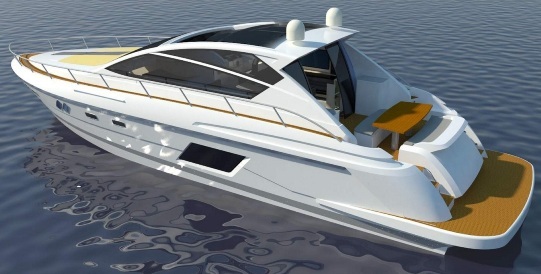 Power options are not yet announced but expect top speed in the forty knots region with the large engines. 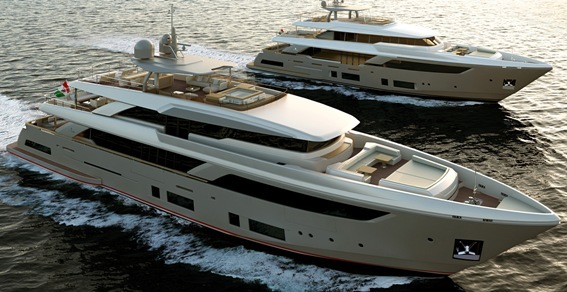 Benetti announces the launch of a new custom build 45 meter displacement yacht hull number FB701, named M/Y Domani. FB701 build at the Viareggio Benetti shipyard, will be delivered in June 2016 to a long standing client, at his fourth Benetti yacht. Client is an expert sailor who loves cruising with his family around the world. His experience along with to Benetti’s professionalism allowed to build an exceptional super yacht suitable for an intensive use. The collaboration started from the first sketches of the project until the launch. The magnificent yacht was launched in the Benetti historical 143 years site, and put into the water in a slide method "sleep-way”. The external design of this four decked steel and aluminum yacht, is the beautiful result of Benetti in-house design team with Carlo Galeazzi responsible for the interior layout with considerable input from the owner and his team. The efficient use of space is one of the peculiarities of this below 500 GT full displacement yacht. This unit construction is based on the technical platform FB700 so to allow reduced delivery time. Special features of FB701 is her design that provides a sensation of luminosity and space with particular areas including the Owner's cabin balcony. The sky lounge on the upper deck overlooks the outdoor area through a huge glass door at full height and full width creating a unique indoor-outdoor effect. The dining area becomes a pleasant “al-fresco” place Preciousness of materials expertly processed by Benetti craftsmen characterize the interiors of FB701. Baglietto’s 46 m hull #10221 is due to be launched in just over a month, marking the birth of the La Spezia based boat builder’s new Fast line. The 46m Fast is an evolution of previous models, but also ensuring great continuity with the brand’s tradition, is the result of Baglietto’s cooperation with Francesco Paszkowski Design. Following in the wake of the sleek aluminium planing yachts that have made the brand’s success all over the world, the new 46 m Fast stands out for its streamlined bow and rakish lines expressing a strong personality, but can also boast an imposing stern, thereby maintaining the family feeling with previous Baglietto yachts. The trapeze-shaped windows in the hull alternate with rectangular ones arranged on two different levels, enhancing the slender shape of the hull and giving a more contemporary touch to the yacht's highly charming outer profile. Another new element characterizing the exterior lines is the compact shape of the superstructure, which is not too high to enhance aerodynamic penetration. When designing this new super yacht, great care was also devoted to maximizing the outdoor areas, so as to allow passengers to be in closer contact with the sea when both cruising and at anchor, and to enjoy conviviality in the open air. The aft area of the upper deck is indeed like a huge open terrace overlooking the sea: featuring teak floors, it can be furnished with a large table and a spacious sunbathing area. Fitting-out operations are now about to be completed in the interiors, which have once more been designed by Paszkowski and architect Margherita Casprini and stand out for incredibly spacious volumes for a planing vessel of this size. The warm shades of rosewood alternate with the colder white lacquered ceiling and side panels, resulting in very refined, contemporary, stylish interiors. The traditional layout offers four ensuite guest cabins on the lower deck, and a master state room on the main deck featuring an office dressing room, and the bathroom. The upper deck is large enough to host a comfortable salon with lounge area, the captain’s cabin, and the helm station, while the crew quarters, are located on the lower deck, and will feature four twin cabins plus a single cabin and the dinette. The yacht, entirely built in aluminium, will be pushed to a maximum speed of approximately 28 knots by twin MTU engines. It is classified with Lloyd's Register of Shipping and compliant to MCA standards. Returning to full production with new ownership, ideas and a revamp of the range Canados look ahead, with the famed Rome yacht builder tooling its new entry level model the Oceanic 76. Like the other bigger Oceanic the 76 will feature the famed Displaning hull form, which coupled to twin Cat 1150hp engines will reach max speed of 26 knots and cruise in the 18-20 range. The interior of the Oceanic 76 will be offered in a three or four cabins option. While the exterior as the image above shows will be of huge size, both for the gigantic aft deck, or the over sized flybridge up top. The Italian super yacht builder Admiral has announced that its 50 metre C Force named Ouranos has been launched. Built with a steel hull and aluminium super structure the 50 meter C Force reaches a maximum speed of 15 knots and features a full displacement hull. 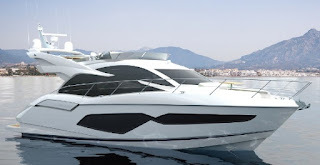 It was launched at The Italian Sea Group shipyard in Marina di Carrara. The interior is a mixture of natural leather and refined joinery and was designed by Gian Marco Campanino together with the Admiral Centro Stile. Guests are accommodated over six staterooms, including the master suite on the main deck. This features a private office and walk-in wardrobe. The three decks are connected by a steel and glass lift. The main design feature of the 50 meter C Force according to Admiral, is the two saloons on the main and upper decks. These are virtually connected by continuous full headroom side windows which go from the main deck sideways up to the upper saloon ceilings. The beach club, which offers in and out spaces, is described as the most iconic feature of the C Force 50. The very aft end of the yacht is an open terrace on the sea. It can be used both at anchor or when cruising. Two side opening hull ports means the beach club can be enlarged, creating two other terraces. The exterior spaces also include the main deck aft cockpit. The upper aft cockpit has been designed as the main exterior dining space, while the sun deck is the party area. It features a large Jacuzzi surrounded by sunbeds. With a project for a new 5400 T-Top flagship Airon Marine shows that after the difficult times which surrounded the Italian nautical industry of past years, the last months have been glimmering a light at the end of the tunnel. May be it is a sign of things to come by Airon Marine headed by Paolo Molinari and his sons, but this is an interesting sports yacht and new flagship from the Lake Como boat builder. The 5400 T-Top is a three double cabins sport yachts with the usual propulsion and semi custom versatility associated with Airon in all its range from the smaller to the larger of models. Main feature of the Airon Marine will be a lower deck dedicated to a galley located at port side, and three double cabins all with own private shower head. Main owners room is a full beam midships located suite, with toilet and shower duties located to port side. A crew cabin is located at midships in between the owners cabin and engine room. Up top in a fully enclosed or open enivorment will be a layout offering a C-shape dinette and chaise lounge to port, with helm station and a second galley to starboard. Aft deck will feature a dinette with opposing settees which can transform to a sun-pad if lowering the table. Tender stowage will be in an aft garage. Engine choices will come all from Volvo from twin 900hp on line shafts, or 626hp and 725hp with IPS pod propulsion. Prestige continue to upgrade its Yacht Division line with the launch of its new 680, currently the second largest model of its range and following up on the positive critics the 750 received. Like the 750 the new Prestige 680 designed by JandJ and Garroni unlike trends of the last decade or so in this size, features an innovative owners stateroom forward with an independent entrance layout. Three or two other cabins depending layout choice are located at midships, with a crew cabin sleeping two at aft. The main deck and living quarters of the Prestige 680 is centered around the astern galley located by the patio door to port side, opposite this is a dining table for eight, while forward is the helm and relaxing L-shaped sofa. The Prestige 680 will be powered by twin Volvo 900hp with the largest of the IPS pod drive units. These units, rather small for a 21 meter motor yacht reach okay speeds of 30 knots max and 25 cruise thanks also to a light displacement of only 29 tons in dry mode. Galeon presents the projects for a 365 HTS, those three letters standing up for hard-top sports. Continuing into Galeon's third generation integrated exterior looks, the 365 HTS stands for being one of the most sleek looking sport cruisers with patio door main deck and a size of eleven meters. The 365 will feature a double cabin interior sleeping four below decks. An open layout with a double berth forward is joined by a galley to port side, and an L-shaped dinette just before the bed. At midships we find a double berth cabin. The main deck offers a standard med sport cruiser layout with an aft sun-pad, large C-shaped dinette to port side, and helm station and galley to starboard. Power comes from twin engines with a maximum total 700hp option. Mulder's largest build to date, this fully custom 34 meter steel hull aluminium super structure shows the stuff of things to come from Rijndijk in the Netherlands. 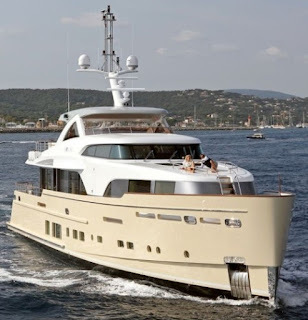 Since relocating in the new facility in 2013, the Mulder household has been building larger yachts and the 34.00M designed by Claydon Reeves and Van Oossanen for naval architecture is testimony of the fully custom construction capability of the Dutch builder. Claydon Reeves for this Mulder designed interesting contemporary lines offered in a two half deck raised pilot house, coupled with an accommodation with four double guest accommodation below in four suites. Crew quarters offers accommodation for seven persons. Engines are twin Cats 670hp giving top speed of 13 knots, cruise of 11 and a long range of 10 offering a 3800 nautical miles distance capability. Last month PowerYachtBlog celebrated its nine years in operation. Looking back all this period was a long road and a challenging one for the nautical industries. With new challenges, from record oil prices to one of the greatest global recession since the big depression of the 1930's. Going forward it seems the only way is up. When starting in 2007 the pleasure nautical sector had the best two years ever seen since it became an industry, and following that one of the most depressive from 2011 till 2014. It is interesting times ahead and the challenges for boat builders and designers have not stopped. In reality they will never stop. Owners want more but the market which characterized the best growth in the best years, the size from fifteen to twenty meters is still in a numb recovery mode. Super yachts are up and smaller sizes are always on a swing.